Summer brings lots of celebrations, activities, and outdoor sporting events that you want to attend and enjoy. The Fourth of July, with brilliant and loud fireworks displays, is one long celebration weekend as are the thousands of local weekend festivals held across the US. While you, your family and friends gather, cheer, and scream through the excitement of it all, it’s important to remember to protect your ears and throat. We’ve all had the experience of hoarseness and swallowing discomfort in our throats after riding with friends in a speedboat or after attending a baseball game, parade, fireworks display, or even after trying to talk above the loud music at a pool party. That’s because we’ve strained our vocal chords. Most people don’t know that they can cheer or speak loudly without sustaining damage to their voices and throats and it’s similar to the way that professional singers use their voices. Instead of tightening and straining your throat, relax the throat muscles and let the sound roll off your tongue. You can still increase the volume of your voice without tensing the muscles on either side of your neck. Also, the lower you make your voice, the easier it will be to let the sound roll out naturally. Be aware of noise levels wherever you go throughout the summer months. Not just for your sake, but for your children’s sake, as well. High noise levels can adversely impact hearing, especially in children. The National Institute of Health reports that about 15% of those living in the US between the ages of 20-69 suffer from high frequency hearing loss that has been traced to vocational and/or leisure activities. Noise levels are measured in units called decibels. The risk of noise-induced hearing loss increases in direct proportion to the sound decibels and the length of exposed listening time. The American Speech-Language-Hearing Association (ASLHA) proposes that sounds louder than what a blow-dryer, kitchen blender or food processor produce (~85 decibels) can cause permanent hearing loss. Think about it! This means that certain tools (lawn mowers), accessories (MP3 players), venues (arcades and concerts) producing over 85 decibels of sound can permanently impair your hearing. As you can see, most of us are exposed to dangerously high levels of sound not just over the course of a summer but just in a few summer days. Here’s what you can do to protect your hearing. They can be purchased at drug stores, sporting goods or big box stores. They will adequately protect your hearing. If you regularly attend noisy events, you can have your ENT doctor customize a set of earplugs just for you. Earmuffs protect hearing as long as they fit tightly over the ear. A consideration for children is to wear both earplugs and earmuffs together. When you’re at a noisy event, leave the area for a respite from time to time to give your ears a break. 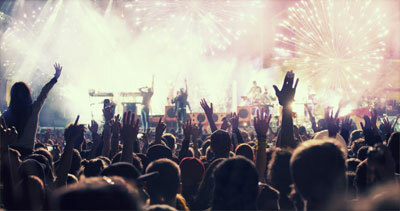 Ringing or buzzing in your ears during or after a concert, even if it subsides or goes away, can result in permanent hearing loss years later. In this case, don’t be a rock star. Protect your ears, instead. How loud did Wrigley Field get during Game 3 of the World Series?